When I was younger, I used to buy albums on tape. It meant you had to listen to it all because FF was really fiddly, so I developed a love of the album track and how songs fitted together to make an album. Now AKG have lent me a pair of AKG K545 headphones and I’m revisiting some all time classic albums in high fidelity. In order to get the most out of the recordings, all albums are listened to in either lossless format (FLAC) or CD via a Fiio E17 DAC (digital to analogue converter) on my PC. There weren’t many musical queues I took from my parents but a bit of love for Simon & Garfunkel was one of them. 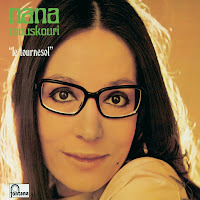 Subsequently I’ve been a bit unimpressed with Paul Simon’s solo work from the 70’s and early 80’s when I checked it out. There are some individually good tracks like Me and Julio Down by the Schoolyard and Fifty Ways to Leave Your Lover but more or less everything between the end of Simon & Garfunkel and Graceland isn’t really my cup of tea. 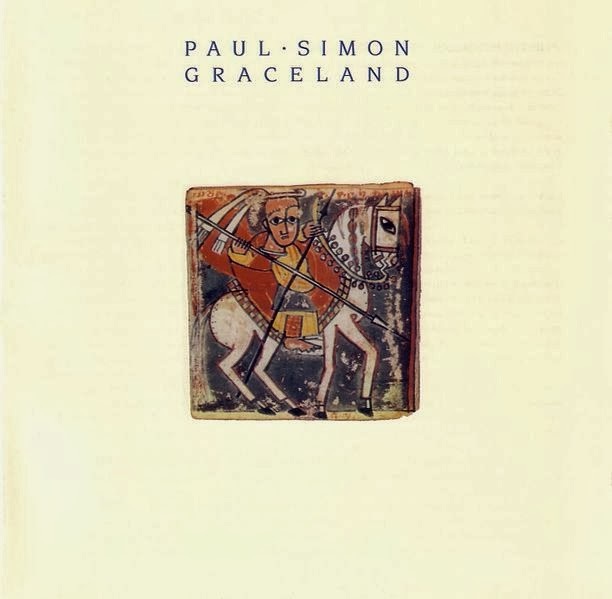 At the time there was a fair amount of controversy over Graceland as Simon had traveled to apartheid era South Africa to record with African musicians and he was felt to have broken the cultural embargo on the incumbent regime. This all went well over my head as an 11 year old though, and I remember loving the album as soon as my Dad put it on. Paul Simon has always been an extremely gifted lyracist, even if on occasion his lyrics don’t particularly make sense- he often picks words of phrases because of the feeling or mood they evoke or how the work together rather than for any literally sense. For example, in the albums stand out hit, and the solo Paul Simon song most people are likely to know, You can call me Al, there’s a line, “He sees angels in the architecture, Spinning in infinity..” Lovely line, not much relevance to the rest of the song. Even the names Al and Betty in the song have been speculated to death, some people reference Dante, some the Betty Ford clinic. Who knows, it just sounds right. I don’t know what’s more impressive with Graceland, the effortless ease that the songs carry themselves off with, something few people aside from Jack Johnson seem to manage today, or the fact he wrote the album after his break up with Princess Leia Carrie Fisher. Quite what a bloke in his mid 40’s had been doing married to an actress in her late 20’s is anyone’s guess but I suppose the Jabba Sailbarge outfit she wore in Return of the Jedi might have had something to do with it. Along with his prodigious bank balance. The thing I like about this album through the AKG K545s is how neutral the headphones interpretation of the album is. The bass isn’t excessive but it is full and rounded, something that is important given the amount of drumming. It makes me want to dig out the follow up album, Rhythm of the Saints, which is even more drum lead. Subsequently loads of musicians have buggered off overseas and successfully ripped off worked with local musicians from exotic foreign parts. Jimmy Page and Robert Plant (the better known half of Led Zeppelin) did it on their No Quarter album, which was excellent in all it’s hurdy-gurdy-influenced pomp. 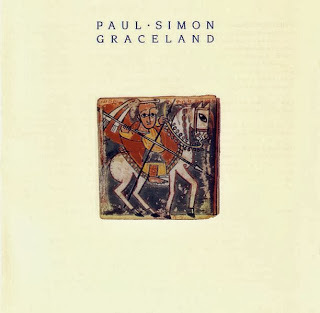 But whether it’s Graceland, The Boy in the Bubble, or the haunting Homeless, it’s seldom done as well as Paul Simon did with the ever so wonderful Graceland album. I had a fairly gentle progression into heavy metal, starting off with hairspray rock stalwarts Bon Jovi, then Def Leppard, moving on to Guns ‘n’ Roses, some of the more commercial Metallica and eventually on to Megadeth. 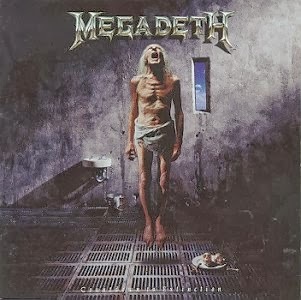 Countdown to Extinction is Megadeth’s answer to Metallica’s commercial self titled album. You know the one, it had Nothing Else Matters and Enter Sandman on it. Anyway, Megadeth’s main man Dave Mustaine used to be in Metallica, which is no mean feat given that both bands form half of the classic thrash quartet along with Anthrax and Slayer. Thrash is basically metal played really really fast and there is plenty of really really fast playing on Countdown to Extinction. This is probably the album that saw Megadeth cross over into the mainstream more so than any of their previous releases. I love some of their older albums like Rust in Peace and Peace Sells but Whos Buying… but they are quite lo-fi in terms of recording and in many ways sound quite of their time. Countdown on the other hand is multi-layered and extremely polished. Unusually Mustaine’s lyrics, if not his lyrical style ( a sort of half way house between a shout and a vocal sneer) are well worth a look- the album’s title track won the Humane Society’s Genesis Award for raising awareness for animal rights issue for example. Interestingly a run in with a bad pair of headphones made the album unlistenable to me for a number of years. The title track, Countdown to Extinction features some fairly vigorous cymbal playing and the particular headphones I had at the time seemed to isolate this instrument to the point all I could really hear was a “T-zzzzz, T-zzzzz” of the cymbals being played. I’m pleased to say the more neutral sound-scape of the AKG K545s hasn’t replicated this problem. In fact the album was remastered in 2004 and now sounds even better. You can even hear the fretting action on some of the songs it’s that clear. If you’ve never listened to any proper heavy metal, tracks 2,7 and 4 are a great starting point and the most accessible on the album. Our eldest was accidentally born to Symphony of Destruction- the MP3 player was on shuffle in the delivery suite. We’d just had some very relaxing Zero 7 and went straight into Megadeth as he popped out. 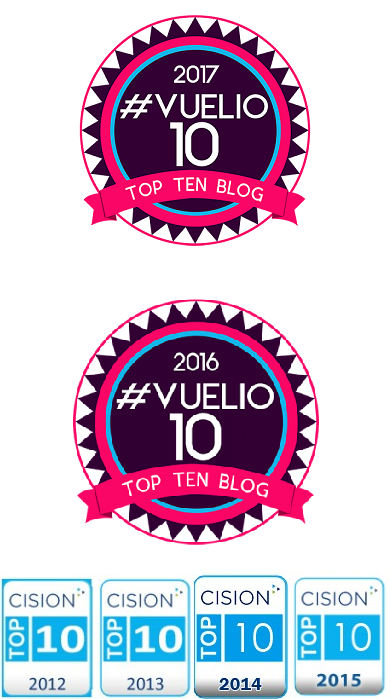 It was fitting somehow but I have subsequently (I think) been forgiven. 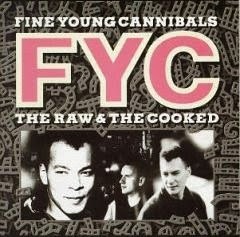 Named after a book by French anthropologist Claude Lévi-Strauss, The Fine Young Cannibals second (and more or less last) studio album was released in 1989 to almost universal praise, hitting the giddy heights of number 1 on the Billboard top 200 album chart. It has a couple of other unique claims to fame too, it was the first studio album I ever bought on cassette (after I’d purchased Hey Hey, it’s the Monkees Greatest Hits) and it contains the only known song that Jools Holland hasn’t comprehensively ruined with boogie woogie piano in the form of Good Thing. I’d heard FYC on Top of the Pops with the big hit off their first album, Johnny Come Home, and whilst I liked the music, a rather distinctive blend of pop and ska, I had reservations about singer Roland Gift’s vocal style, which was quite a high falsetto (I think that’s the right term), but the first couple of singles off of The Raw and the Cooked were too good to miss out on. Listening to The Raw & the Cooked now, the first thing that strikes me is how much guitar, drum and just pure noise there is on this album. If you’ve got the volume up, Good Thing will almost certainly catch you out with it’s loudness, and the opener She Drives Me Crazy is full of crunchy guitar noise. It’s an album that is full of the joys of life, played quickly, with all bar I’m Not the Man I Used to Be weighing in under 4 minutes. It’s a catchy ska pop fusion, with the pop being at the rockier guitar end of the spectrum to the usual late 80’s electronic sound. I genuinely can’t pick any songs out as stand out on this album, they’re all great and to my mind this is one of the undiscovered classics of the 80’s. It’s a shame that the band didn’t build on the success but it’s a great high to go out on. Listening to The Raw & The Cooked on the AKG K545s has made it sound even better, especially compared to the Sanyo portable tape player I used in have back in the day. I can even hear Jools Holland’s boogie woogie piano on Good Thing clearly enough to recognise it as Jools Holland’s boogie woogie piano, which I never could back in then. Or even a few weeks ago when I tentatively began auditioning albums for this series via my phone and a pair of pretty decent MEElectronics HT-21 on ear headphones. The K545s are the first over the ear phones I’ve used since a huge ponderous pair of Panasonics my Dad had in the early 90’s. The K545s are light and comfortable to wear but deliver such a sound it’s like being there. yes, they do show up inherent weaknesses in the recording process if there are any, and I’ve heard a lot more “1-2-3” count ins that I’ve ever noticed (generally, not particularly on this album I should say). I do remember critics at the time being unimpressed with the Elvis cover, Ever Fallen in Love, but I think it’s a particularly fitting end to the album. If really pushed, I’d have to say Don’t Look Back is my favourite track, purely because I like the lyrics- musically I don’t think it’s any better than the rest. Back in 1990 I still read Q magazine avidly. 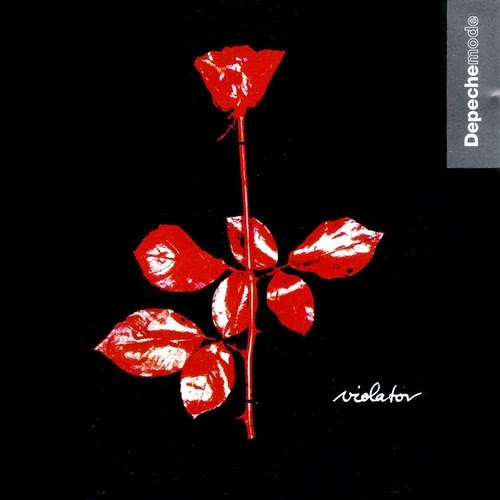 I’d often spend what pennies I had left after fueling my videogame addiction on a 5 star album from the latest issue and one of those happened to be Depeche Mode’s Violator. Like many, I was lead to the album but the stand out single, Enjoy the Silence, a song, to my shame that my better half can still beat me at on Sing! on the Xbox. I’m no huge fan of Depeche Mode generally, I have their greatest hits albums but this is the only studio album I actually bought. It’s a very dark and menacing album, shorn of most of the poppy dance sensibilities of their earlier stuff, despite the band apparently being rather unwittingly huge in the US techno scene at the time. Violator is an album that exists pretty much because of drugs. Gore, the bands main songwriter, was, like the rest of the group, taking an awful lot of Ecstasy at the time, and a lot of the doom and gloom is invoked by the crash of coming down from taking it. Likewise Clean details David Gahn’s heroin addiction. Cheery isn’t it? In fact I remember reading at the time of the albums release that Primal Scream, a legendary good time band, actually went cold turkey after touring with Depeche Mode because they were terrified by the amount of stuff the boys were ingesting. Whether that’s true or not I don’t know but it certainly contextualises the album well. Listening to it on the AKG K545s brought out a lot of detail I’d not noticed back in the day. This was an album I originally purchased on tape and later upgraded to CD but shoving a high octane fuel in a jalopy wont make it a super car, and listening to a CD is a mediocre stereo system is pretty much the same. The bass was powerful without dominating the sound like it does with a lot of those expensive fashion headphones. Listening to the album in the dark with the rain lashing against the window was extremely atmospheric. Stand out tracks include Personal Jesus, World in My Eyes, Enjoy the Silence and Policy of Truth. If that’s almost half the album, that’s a pretty good indicator of how good Violator actually is. Punk apparently destroyed prog rock in the late 70’s but in 1977, four years after Dark Side of the Moon was released, the album was still the 36th biggest seller in the UK. To this day it’s the 8th largest selling album in the UK, so the lads must have done something right. In terms of my musical history, I got into Pink Floyd relatively late. I had asked for and received a copy of the Wall on double CD for Christmas sometime in the mid 1980’s but hadn’t listened to it a great deal. 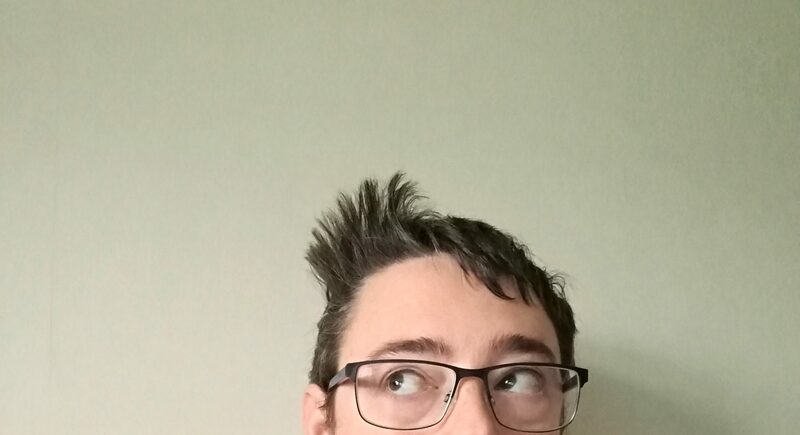 I don’t think my ability to listen to music had developed properly when I first listened to it- I could listen to pop and rock quite easily, especially when the songs were 3 or 4 minutes with an obvious verse/chorus structure but switching to progressive rock and a full blown double concept album was obviously a bit much for me. It wasn’t until the Division Bell came out in 1994 that I really began plundering Pink Floyd’s back catalogue and the solo meanderings of the members. I’ve sworn I’ll only chose one album per artist for this list, otherwise it would be perhaps half full of Pink Floyd albums. This has made it really difficult to chose between the three albums I see as their best: Dark Side of the Moon (the commercially successful behemoth that really tapped into the collective consciousness at the time), Wish You Were Here (the fans choice of best Floyd album and hauntingly beautiful) and The Wall (the double concept album with the notorious Another Brick in the Wall (part II) on it). I could easily argue the case for all three but for the purposes of this list, I’ll go for Dark Side of the Moon as it’s probably the most accessible of them. For those who don’t know, a concept album, like Dark Side of the Moon, is basically an album strung together by a shared narrative, theme or conceit. There is a bit of argument over what the first concept album was but for the sake of argument, I’ll say it was the Beatles’ Sgt Pepper’s Lonely Hearts Club Band. over the next few years, the concept album really kicked off, with everyone from the Moody Blues to the Kinks and the Who making one, or in the case of the Who, two. I think 1969’s King Crimson’s In the Court of the Crimson King is probably one of my favourites and it’s worth a listen if you’re interested in prog. Pink Floyd had dabbled with longer songs and thematic approaches to albums for a few years before Dark Side of the Moon came out. Atom Heart Mother, an album with a big picture of a cow on the cover, had a suite of songs called Alan’s Psychedelic Breakfast on it that weighed in at about 13 minutes and that was followed in 1971 with Meddle, an album that gave the second side of it’s disc over entirely to one song called Echoes that weighed in at 23 and a half minutes. Dark Side of the Moon has nothing like that but all the individual tracks merge into each other and only really work if you listen to the whole album. It’s definitely not one to put on shuffle. The themes of the album revolve around conflict, greed, the passage of time, death, and insanity, all of which had some personal connotation to various members of the group. You’re likely to have heard at least one of the songs, even if it’s only be used as incidental music on a TV programme, since Money has a very familiar ring of cash registers throughout. The album was recorded in the days before much of what we would consider modern technology was available, so the loop of the ringing tills was done by cutting and splicing together multiple copies of the tape. The amount of work that went into something as simple as that, something that would take about 20 seconds on a computer today, is mind boggling. I started buying CDs at probably the worst time possible in the early/mid 1990’s. Most CDs at that time were quite shoddy transfers from analogue across to digital, complete with hiss, and lack of depth to the sound. Infamously I remember a friend commenting when Led Zepplins 4 Symbols album was remastered that John Bonham’s drumming on When the Levee Breaks didn’t sound like someone sitting at the bottom of a Welsh well banging on up turned paint cans any more. And it was pretty much like this across the board, Pink Floyd’s 70’s output was no different. To this end I now own about 3 different CD versions of Dark Side of the Moon, and as the remastering has progressed, so has the quality of what I’m listening to the album on, and consequently I am still hearing new things almost every time I put the album on. 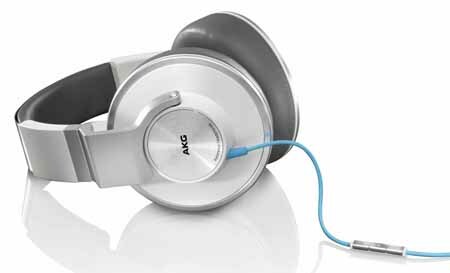 The AKG K545s give a wonderfully neutral sound, something pleasant in the bass obsessed world of headphones. That’s not to say the bass is weak, the thundering bass line at the start of Time is majestic, but it doesn’t overwhelm the sound. A lot of the background vocal snippets are very much clearer than they’ve ever been to me too. Cheery isn’t it? 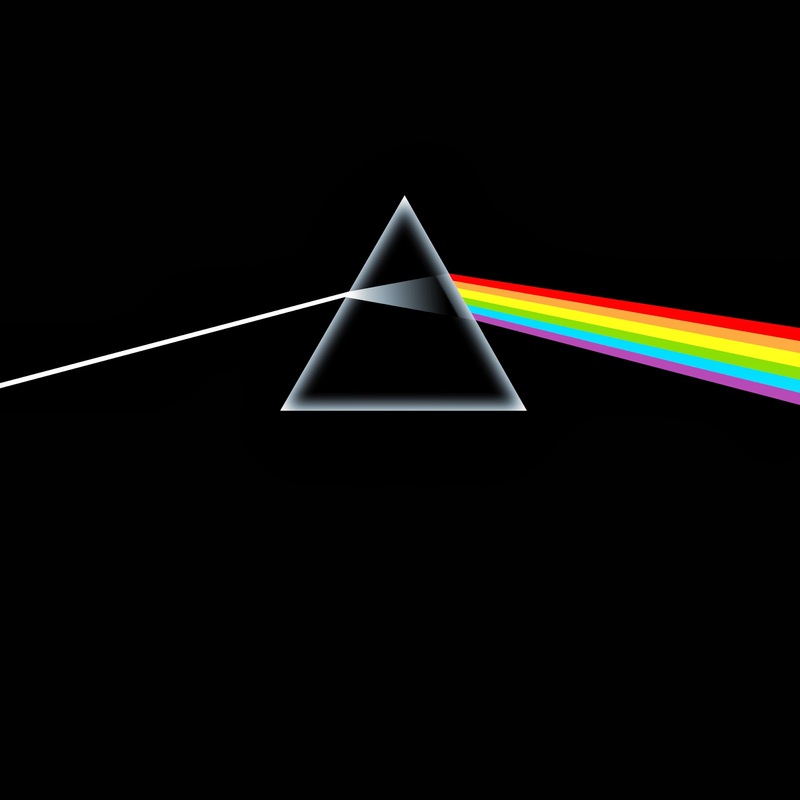 But sometimes you don’t want cheery and for those times there is Darkside of the Moon, an all time classic. Looking at the top selling albums in the UK of all time, it’s interesting to see that the top two places are taken by greatest hits albums from ABBA and Queen respectively. The UK has always had an obsession with the singles chart and this has partly been fueled by long running shows like Top of the Pops and The Chart Show. In pretty much any history of contemporary music there is always the narrative that punk came along and blew the ridiculous excesses that rock had degenerated into out of the water. However large the cultural impact may have been, the chart impact was fairly minimal. I think Blondie’s Parallel Lines is the only album even vaguely punk related to make it into the top 10 best selling albums of the year in the UK. I would however like to point out that rock did have it’s excesses, and those definitely include the likes of Rick Wakeman’s The Myths and Legends of King Arthur and the Knights of the Round Table, which was performed live on ice. The problem was and still is a big disconnect between album and single sales. If you’re a prog rock band putting 9 minute songs on an album you’re not likely to get to the top of the singles charts. I started listening to music like most kids do, via their parents. A lot of my peers parents were into the Beatles, the Rolling Stones or the Who but my parents are a couple of years older and into completely different stuff. My dad was interested in a lot of the new folk revival music like Simon & Garfunkel, the Seekers and Peter, Paul & Mary, mixed with Nana Mouskouri and the Carpenters. My mum was a huge Cliff Richards devotee, and didn’t really go past that other than to listen to Radio 2 a lot. For a long time she thought Pink Floyd and Dire Straits were interchangeable, which was a source of embarrassment for me when I started to get interested in music. It took me a LONG time to find the sort of music I liked, and needless to say Cliff wasn’t in there. I do like a bit of folk though. It was a journey that started out with cassette tapes and a Sanyo version of the Walkman. The earphones I had with it were terrible and the hiss from tape is something that you have to hear to believe. I was born in 1975, which means that for my formative years, music was strictly LPs, tapes and radio. When my dad bought himself a new fangled hi-fi system with a CD player, I inherited his old Wharfdale separates system that had a tuner, top loading cassette deck and a record deck. It also had a wonderful wood effect vinyl finish on it, which was lovely. The first albums I bought were Hey Hey Hey its the Monkees Greatest Hits, Velveteen by Transvision Vamp and the Raw and the Cooked by The Fine Young Cannibals, I was in my early teens by that point but they were all on cassette. I subsequently did buy a few albums on CD before I had a CD player, and ended up sitting behind the sitting room sofa plugged in to my dad’s hi-fi. As the years passed I got better equipment and ended up re-buying a lot of the early albums I bought. Not just the cassettes either but a lot of the early CDs. Early CDs were often transferred to this new digital medium really badly. A poor analogue copy was transferred which meant the sound was really iffy. The mid to late 90’s saw a lot of the classic albums undergo what was called a remastering process to clean the sound up and make them sound better. Jimmy Page of Led Zeppelin went to great lengths to make sure all the bands catalogue sounded brilliant, and the same happened to Pink Floyd’s albums and most of the popular groups from yesteryear. I have four copies of Pink Floyd’s Dark Side of the Moon- cassette, CD, digital remastered CD and a 25th Anniversary CD/SACD hybrid. 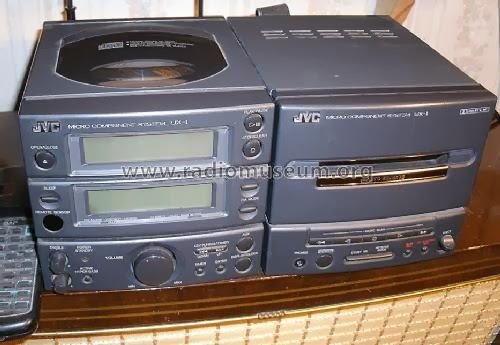 I still don’t know anyone with a SACD player mind you. As the quality of the recordings improved, so did the amount of detail I heard in the music. The limiting factor then became the equipment I was playing it on, and ultimately the earphones or headphones I was listening on. There was a blip when MP3 players were introduced since I’ve always been a bit of an early adopter and the storage limitations meant the quality of early MP3s were terrible but after that I’ve been on a steady quest to find the best pair of headphones for listening to my favourite music. I started off with Shure EC2s, which were great but uncomfortable, moved on to Shure SE115s when they died but they weren’t much good. Since then it’s been a veritable mix of brands and phones, like Koss PortaPros, MEElectronic HT-21s, RHA MA-350s and a pair of Scuderia Ferrari R200s. The Ferrari branded Logic3 headphones are the best on ear phones I own but the Shure EC2s were, despite their shortcomings the best sounding I owned. That all changed when I was invited to a Harman Kardon Dads event around Fathers Day and I got to try out a pair of AKG K550s. The sounded incredible- a really wide sound that was very clear, had plenty of bass without being dominated by it; all in all a very natural sound. I lusted after them for quite a while and although there were cheaper than the Ferrari headphones, I had won those in a competition and couldn’t justify spending slightly over £200 on a pair of headphones, no matter how good they were. After 5 a side football on a Wednesday, I’ve been listening to the excellent Peoples Songs on Radio 2. It’s lost in the scheduling at 10pm on a school night in many ways but it has made me nostalgic for the music of my youth. I dug out some of the albums I used to listen to (and in some cases still do) and set about trying to listen to them in the best circumstances I could. I have whats called a DAC- a digital to analogue converter, that plugs into my PC to deal with the process of converting the digital CD file into sound. In some instances, I’ve actually re-purchased albums like In the Court of the Crimson King, because I still owned a terrible hissy version on CD. The problem was, even on the Scuderia Ferrari R200s, the sound wasn’t as good as I remembered lossy MP3s sounding on the AKG headphones that evening at Harman Kardon. I dropped the chaps at Harman Kardon an email and asked if I could borrow a pair of their headphones for my retrospective album nostalgia trip. In return, I said I would blog about my musical exploration with the AKG headphones. 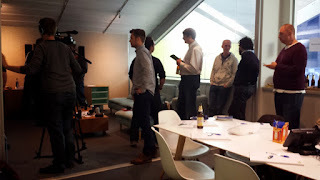 When someone invites you to a trendy converted bus station for beers, pizza, more beers, and a play with some Harman Kardon, JBL and AKG products, it’s a bit of a no brainer, especially when you’re one of ten dad bloggers invited. So I said yes, hopped on the train to Ravencroft Park and met up with a load of top blokes for an evening of entertainment. Luckily enough I knew (even if I hadn’t met in person) 8 out of the other nine dads. The only gent I hadn’t met was Stokey Dad and since he has a section called “Daddy Cool”, he’s alright with me anyway. In between rating people on how close they resemble their twitter avatar picture and catching up, we had a lot of audio equipment demoed to us by a very nice chap from Harman Kardon. Fortunately all bar the AKG headphones were BT, so when the chap demoed everything with Adele, I snuck a connection to one of the devices and blasted Ace of Spades out over it. And I would have gotten away with it if it wasn’t for those pesky PR types! It was quite good fun as we all played our music collections over the BT speakers, daring each other to judge us. Personally, I blasted out the Who’s Baba O’Reilly and a bit of Megadeth as well as B&T Overdrive. I also accidentally stumbled onto the world of all female cover bands, when I put on Lez Zepplins version of Kashmir. 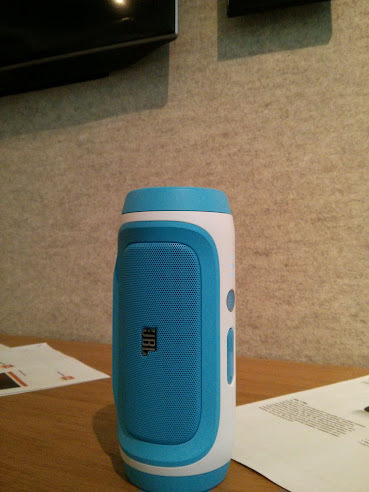 The JBL Charge is an interesting spin on a bluetooth wireless speaker. As well as being pretty funky in terms of colour and chunky design, it also comes with a standard USB port that allows you to plug in a cable and charge your phone when you’re out and about. Considering it has a 6000mAh battery, which can power the speaker for 12 hours of play back, charging up a flat battery on an iPhone 5 (battery capacity of 1440mAh) should only take about a quarter of it’s juice, so you’d still have 9 hours left to play some funky tunes. But that’s all nice and stuff but how does it sound? Well that’s the surprising thing, the JBL Charge is a small device but it punches well above it’s weight- 2×5 watts to be precise. It’s good, Bachmann & Turner Overdrive awesome in fact. And yes, I did play You Ain’t Seen Nothing Yet as loudly as it would go and yes, the chap from Harman had to turn the volume down manually when he wanted to talk about the next device. Despite the volume it’ll go to, the JBL Charge doesn’t distort at all. How d’you like them onions eh? I was pretty impressed with the JBL Charge myself but… …The AKG 551s completely blew me away. They’re an over the ear pair of closed back headphones (they cover your ears and don’t leak noise- probably a favourite with Adele fans who don’t want to let the whole world know what they’re listening to) that manage to have great sound fidelity along with a more than reasonable price (£199). I happened to have my pair of £260 ‘cans with me just in case I got the chance to do a direct comparison. I’m fairly pleased with my pair, I won them in a competition and as far as on ear jobbies go, they’re the best I’ve owned. The best I’ve owned full-stop were a pair of Shure Ec3’s that more or less resided in your ear canals and sounded awesome but after 5 years use, the cable died and the replacement model was about £400.The AKG 551s are much much better than my (more expensive) pair. 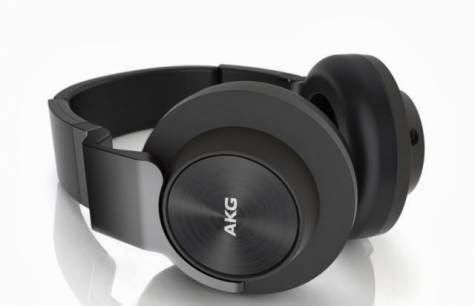 Whereas the trend with mid to high end headphones currently is excessive bass to the detriment of pretty much everything else, the AKG 551s sound very unadulterated. They’ve got power, but a crisp clear sound to boot. I was so impressed, I’m going to grovel to borrow a pair for an extended road test with my FLAC rips of Pink Floyd. Finally, and by no means least, those nice chaps at Harman Kardon kindly gave us each a JBL SoundFly BT (RRP £149) to take home. This is a diminutive mains powered bluetooth speaker that has to be heard to be believed. We have a couple of Sonos PLAY:3’s in the house which have great sound. This costs less and is about a third of the size but once it’s run in (about 20 odd hours of music), it runs the much larger devices pretty damn close. It’s design is clever, it just plugs into the wall, making it ideal for use in the kitchen or the garden. 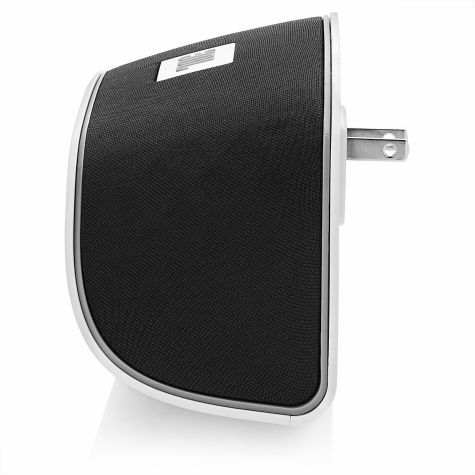 In common with all the JBL products we saw, the sound is pretty uncommon for something in that size and price range. I’m used to hearing poor audio quality and distortion at volume from product at this sort of range but the SoundFly BT again beats expectations. 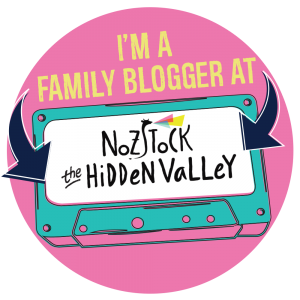 It’s ideal for holidays too, since you can just plug it in somewhere and really irritate your kids by having the same music you bore them to death with at home on holiday. Keep your eye out for some more JBL/AKG/Karman stuff, I’m intrigued.